MOSCOW --- The first two Project 11356 frigates for India will be built in three years, Head of Russia’s United Shipbuilding Corporation Alexei Rakhmanov told reporters on the sidelines of a TASS-hosted forum dubbed "Korea and Russia. Economic Cooperation Dialogue" on Friday. Russia and India earlier signed a contract for the construction of four Project 11356 frigates. 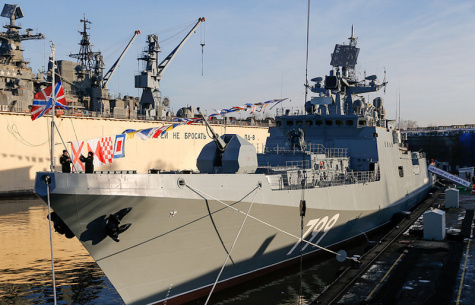 Two of them are planned to be built at the Yantar Shipyard in Russia’s Kaliningrad, while the other two will be constructed at India’s Goa Shipyard Limited (GSL). "Our usual construction time is 36 months, and I hope we will meet the deadline," Rakhmanov said in response to a question. A source close to the Indian defense industry earlier told TASS that the contract for the second pair of frigates that would be built in India envisaged technology transfer. Project 11356 frigates are designed for attacking enemy surface ships and submarines and repelling air attacks independently or in cooperation with other ships in a naval task force. The frigates are armed with 100-millimeter artillery piece A-190, Kalibr and Shtil missiles and torpedoes. Every such frigate has a displacement of 3,620 tonnes and a length of 124.8 meters and can carry a Ka-27 helicopter. The 111356 frigate’s full speed is 30 knots and its operational range is 4,850 miles.